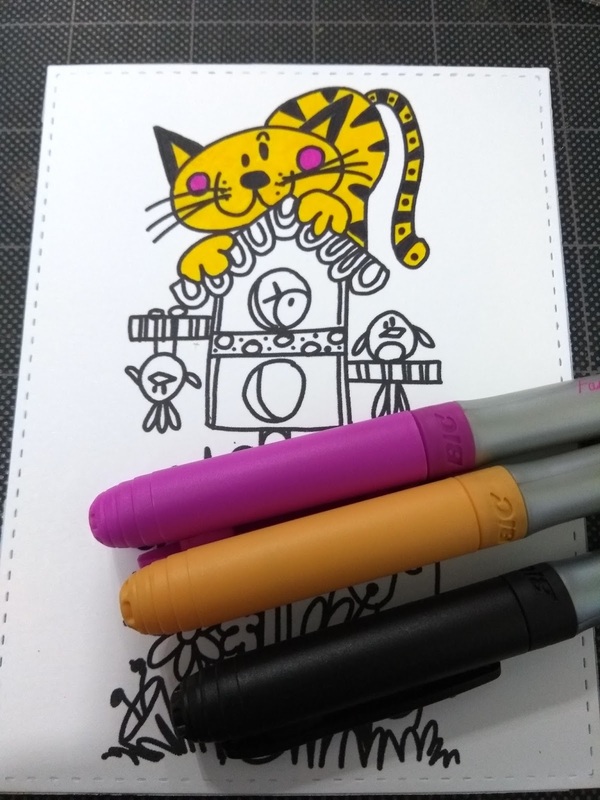 Since the sponsor for this challenge is Bugaboo Stamps I wanted to use one of their images. 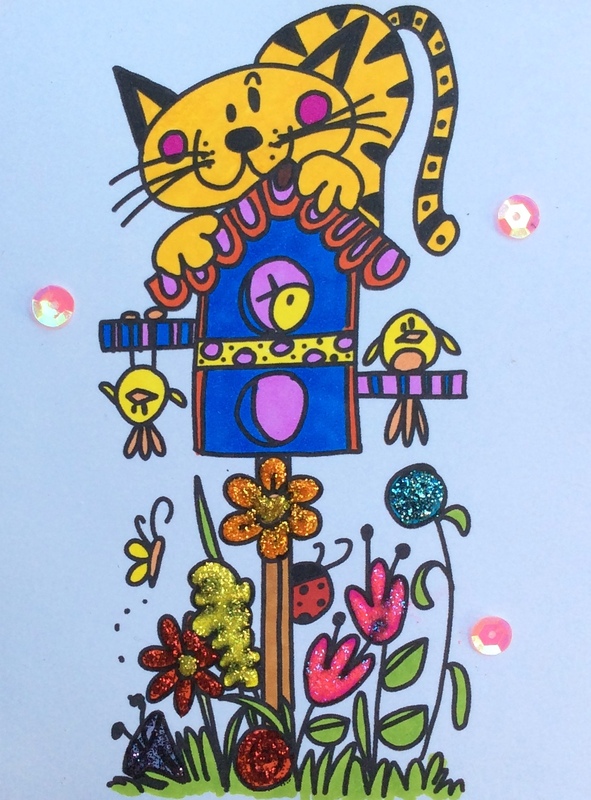 I decided to make a "spring" card and used Whimsical Cat 1 (Bugaboo) as my image. This is a super simple card to make. I printed out the image on to white cardstock and colored it with a variety of my BIC markers. I then cut it using a stitched rectangle die. Next, using the Polkadot Flowers Digi Paper, also by Bugaboo, I printed one of the designs onto a piece of white cardstock, which I then trimmed and adhered to my card front. I cut a piece of white fun foam that I adhered to the white cardstock, which I then adhered to the card front. 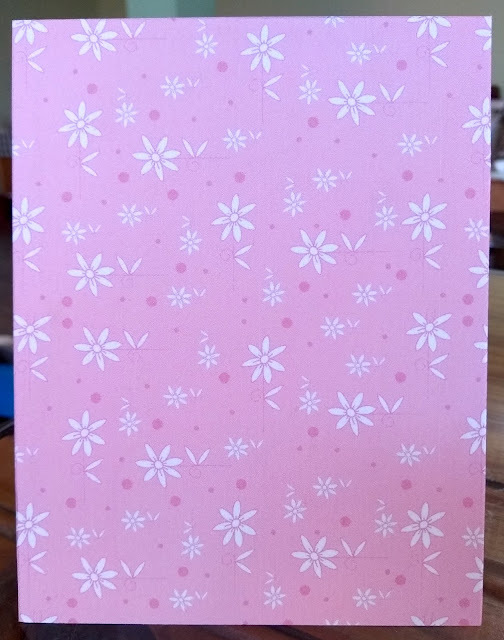 I also used some Stickles (Ranger) on the flowers and then I adhered 3 small pink sequins to finish off the card. I left the inside blank so someone can write what they want. And that's it! 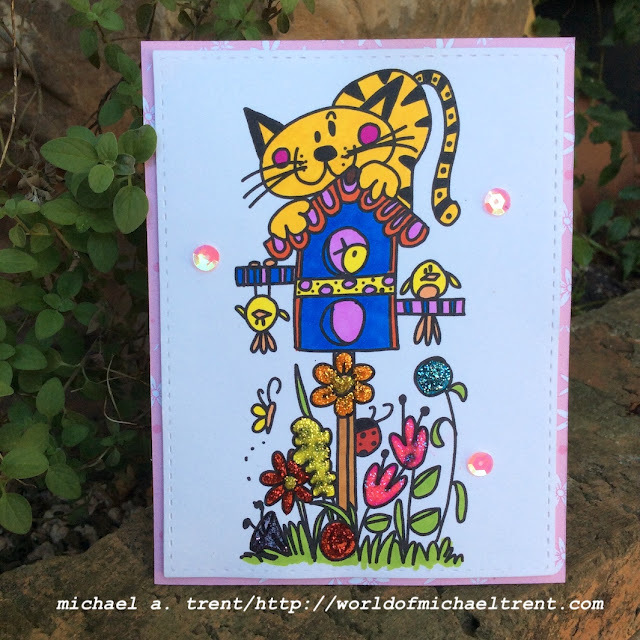 Today I have a card I made for a friend who loves butterflies. I have made a card like this [here] but I had the idea to make the butterflies 3D and had to get this idea out of my head. I used Butterflies 1 and 2 from Anthony's Paper Craft again but this time with watercolor paper and BIC markers, which blended beautifully on the paper. I hope you guys like how this came out as much as I do! I started by cutting a piece of white cardstock with the large stitched rectangle die from the Stitched Shapes Bundle (Simon Says Stamp). I placed the cardstock in my Misti, centered Butterflies 2 (Anthony's Paper Craft) on the cardstock, closed the lid and stamped the image several times with London Fog Memento Ink. This ink might bead up or look blotchy but give it some time to dry and it will look fine. 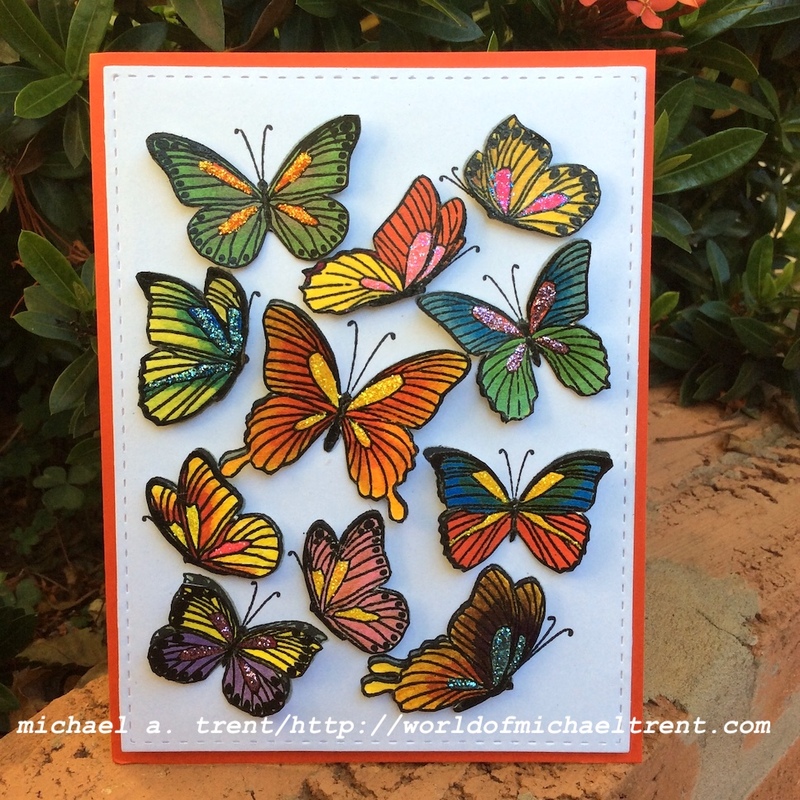 Next, I placed Butterflies 1 (Anthony's Paper Craft) over the solid stamped image, closed the lid, and then stamped this image using Tuxedo Black Memento Ink. 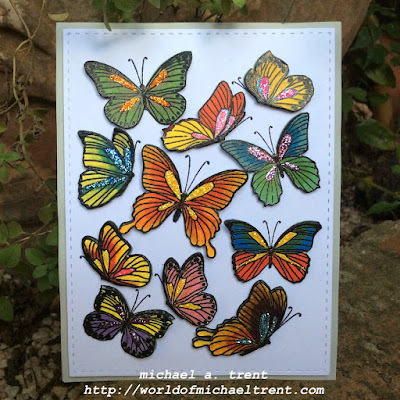 On a piece of watercolor paper, I stamped Butterflies 1 again and colored the butterflies with my BIC markers. I love how some of these colors blended. 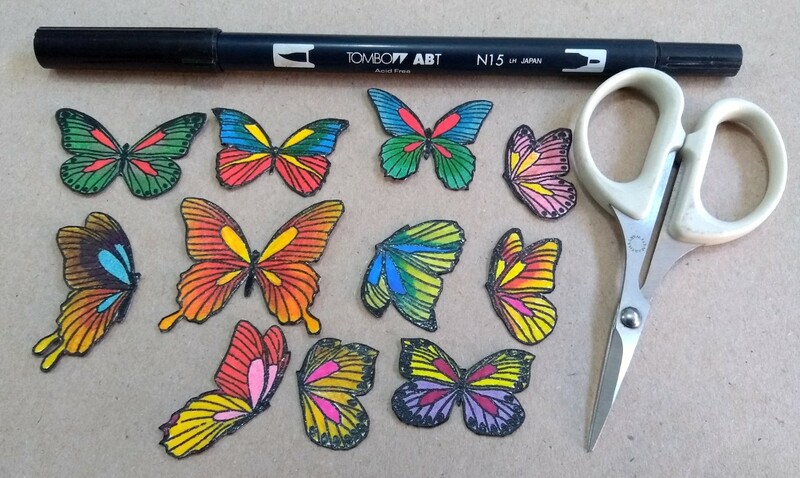 I then fussy cut the butterflies using a fine tip scissor by Martha Stewart and then I ran a black N15 Tombow marker around the edge to get rid of the white border. I adhered the cardstock to a piece of fun foam and then to the card front. I then adhered all the butterflies making sure I did not glue all the wings down - gives more dimension to the butterflies. Lastly, I added some stickles to parts of the butterflies for some glimmer. If You Give A Crafter A Cookie Challenge 91 with Unity Stamp and an Ice Cream Truck! 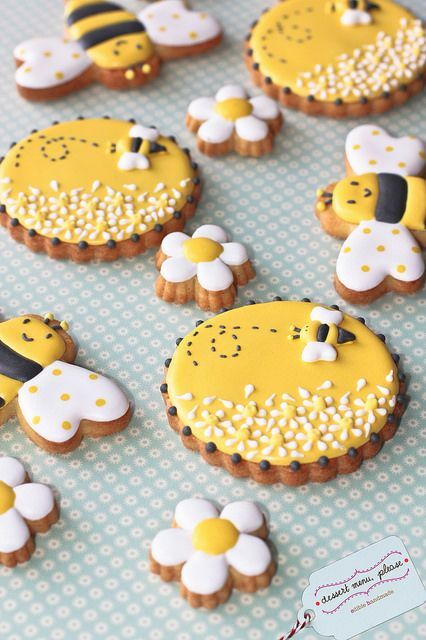 I saw over on the If You Give A Crafter A Cookie Challenge Blog that the current challenge, Cookie Challenge 91 - is all about transportation. 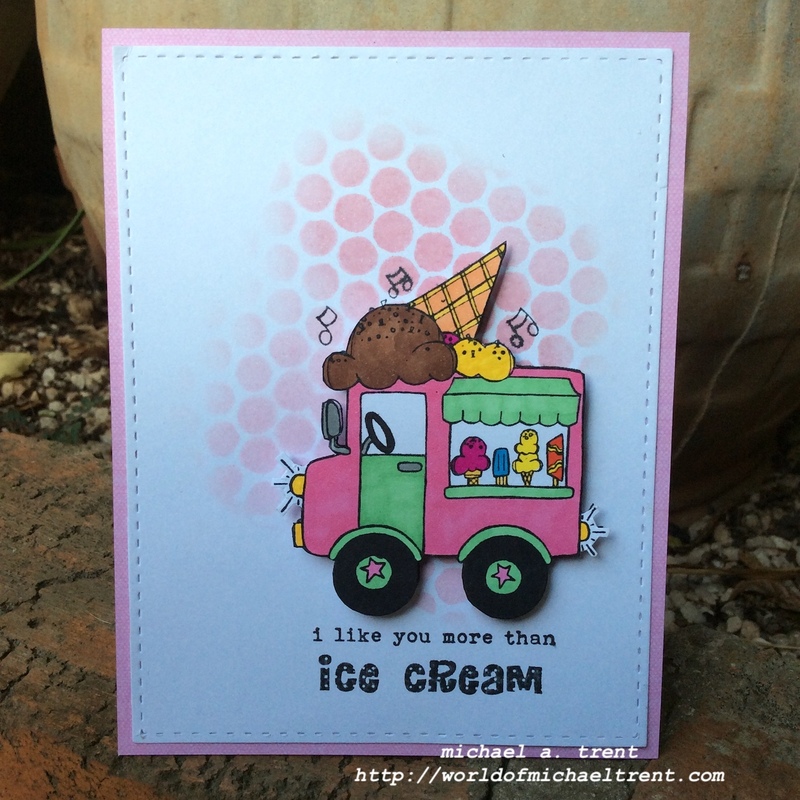 This ice cream truck stamp set was sitting on my desk and, since this is a form of transportation, I was able to pop this clean and simple card out of my head! I cut a piece of white cardstock using the large stitched rectangle from the Bundle of Stitched Shapes (Simon Says Stamp). Then I placed the Journal Texture No. 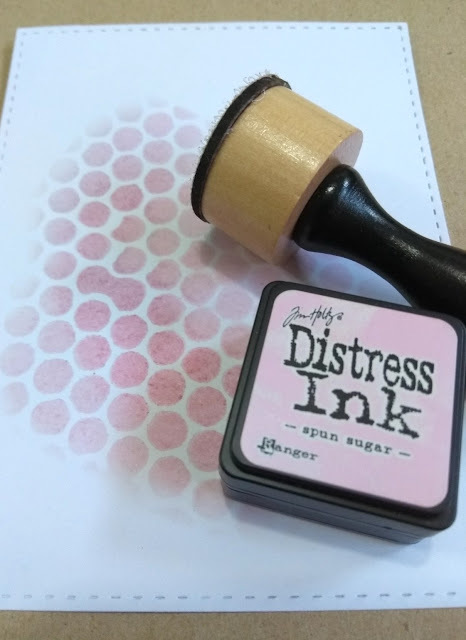 2 stencil (StencilGirl Products) down on the cardstock and distressed over it with Spun Sugar Distress Ink by Ranger. Next, I stamped the ice cream truck from the More Than Ice Cream set (Unity Stamps) on a piece of white cardstock and colored it with a variety of BIC markers. Then I fussy cut the ice cream truck (really, not that hard). I also stamped the ice cream truck on top of the stenciled area because I wanted to keep the music notes coming out of the truck. I also stamped the sentiment under the image. Lastly, I adhered the white cardstock to my card front and I adhered some pop dots behind the ice cream truck and adhered it on top of the stamped image. Done! !